The development of stereotactic body radiation therapy (SBRT) began in the early 1990s at the Karolinska Institute (Stockholm, Sweden) with researchers Ingmar Lax and Henric Blomgren and was derived from the techniques and procedures of stereotactic radiosurgery (SRS). Researchers in Japan and North America helped develop this treatment during this same time in the 1990s. The American College of Radiology (ACR) and the American Society for Radiation Oncology (ASTRO) define SBRT as "an external beam radiation therapy method used to very precisely deliver a high dose of radiation to an extracranial target within the body, using either a single dose or a small number of fractions." 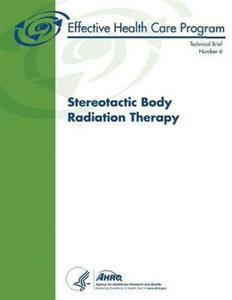 SBRT combines multiple finely collimated radiation beams and stereotaxy (3D target localization). The multiple radiation beams intersect to deliver an accurate, high dose of radiation to a carefully defined location. There are several terms that have been used interchangeably for SBRT. These terms include "stereotactic radiotherapy," "fractionated stereotactic radiosurgery," "hypofractionated stereotactic radiosurgery," and "staged radiosurgery." Consensus does not exist for the definition of SBRT with respect to a maximum number of radiation fractions, the minimum radiation dose per fraction, or the maximum number and diameter of lesions to be treated. SBRT is characterized by patient immobilization, limiting normal tissue exposure to highdose radiation, preventing or accounting for organ motion (e.g., respiratory motion), the use of stereotaxy, and the subcentimeter accuracy of the delivered dose. The key components of a SBRT procedure are target delineation, treatment planning, and treatment delivery. The treatment team includes a radiation oncologist, medical physicist, radiation therapist, and depending on the body site and indication, a diagnostic radiologist, nurse, anesthetist, and dosimetrist as needed.6 Medical professionals, such as surgeons, may also play a role in the treatment team. Stereotactic radiosurgery is a distinct discipline that utilizes externally generated ionizing radiation in certain cases to inactivate or eradicate (a) defined target (s) in the head or spine without the need to make an incision. The target is defined by high-resolution stereotactic imaging. To assure quality of patient care the procedure involves a multidisciplinary team consisting of a neurosurgeon, radiation oncologist, and medical physicist. Stereotactic radiosurgery (SRS) is typically performed in a single session, using a rigidly attached stereotactic guiding device, other immobilization technology and/or a stereotactic image-guidance system, but can be performed in a limited number of sessions, up to a maximum of five. Technologies that are used to perform SRS include linear accelerators, particle beam accelerators and multisource Cobalt 60 units. In order to enhance precision, various devices may incorporate robotics and real time imaging. The goal of this Technical Brief is to provide a broad overview of the current state of SBRT for solid malignant tumors. This Technical Brief reports on the current technologies available to deliver SBRT; the types and locations of tumors that have been treated with SBRT; the possible advantages and disadvantages of the technology; the extent of diffusion of the technology; and provide information about advances in the technology that are currently in development.